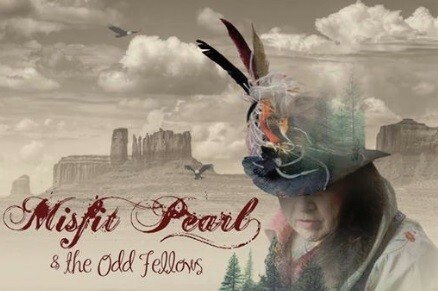 Misfit Pearl and the Oddfellows! Corn fed Kentucky raised singer, songwriter & raconteur, Jane Pearl is a rare thing. A genuine wordsmith [when she can remember them!!] and drawing from all four marriages, using all four chords Jane brings you heartfelt, humorous, well crafted wry vignettes on modern life. Through the medium of Americana, her talent drips from her kitchen table, drops to the floor and saddles up on an epic quest across the Forests of Dean [her present home] into the ears of anjjy freeminer, hobo or chartered accountant passing through the West Gloucestershire badlands. Jane has spent nearly a decade knitting and crocheting two band members that add finesse and groove to what she describes as a "mighty fine trio". Multi-instrumentalist Lyndon Webb, a purveyor of an original 1980s ponytail, on guitars and Thad Kelly, owner of two shopping scooters, on bass. Odd indeed. Genuine talent and musicality abounds, not to be missed! External Website: More details about Forest Folk Club and Misfit Pearl and the Oddfellows!